Mad Level Manager 2.0.0 introduced a new feature called Level Groups. Level grouping feature is basically a possibility to create many level select screens with different set of levels. In games it is usually called worlds or seasons. It’s common to see a message like “to unlock next world gain at least 30 stars”. This is what the groups are for. 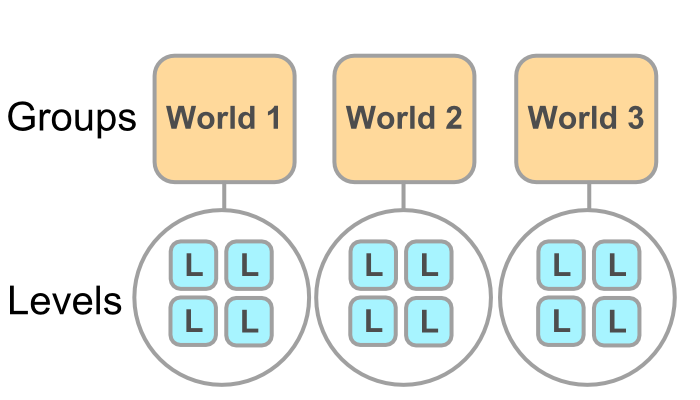 Groups are defined for Level Configurations. 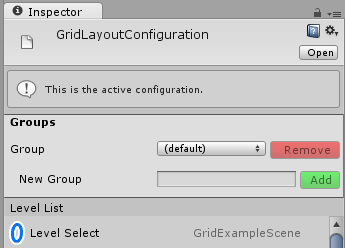 By default all configurations have only one group called default group. In order to create a new group, go to a Level Configuration, on top in the Groups section type in the name of group that you want to create, and apply it with the Add button. You can use the combo box to select a group that you want to work on. Levels will be created always for the currently selected group. To remove a group, select it in the combo box, then just click on the Remove button. You cannot remove the default group. You can easily move levels from one group to another. When level is selected you will find an option called Move to Group in Level Properties section. Just select a new group from this combo box, and level will be moved immediately. How to make groups locked and unlock them when certain number of stars is gained? It is perfectly possible to achieve with Mad Level Manager. This feature is still in development (so it can be easier to implement), but if you need this kind of feature, you should take a look at Demos page. 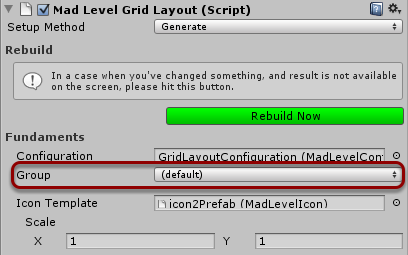 You can find there a unitypackage to download, and an explanation of the setup. 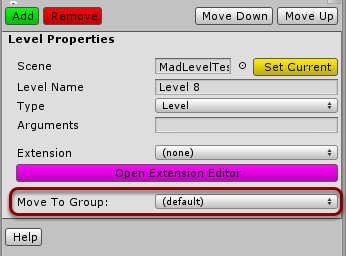 There are plenty of new MadLevel API methods and properties that will help you to work with groups. First level of the second group is right after the last level of the previous group so calling MadLevel.LoadNext() when you are in the last level of a group will load the first level of the next group.